"In SHIVER, Grace and Sam found each other. In LINGER, they fought to be together. Now, in FOREVER, the stakes are even higher than before. Wolves are being hunted. Lives are being threatened. An love is harder and harder to hold on to as death comes closing"
Beautiful cover as always with this series of books. Very similar style, although the colour scheme went a bit out of the window as they had already used the only black & white combinations that they could. The silver is nice and shiny though - I like a lot!! Possibly the most exciting book release for me this year. I've been addicted to the Sam & Grace love story from the beginning. I even bought the US hardback editions, I am that much of a fan!! Then book twos introduction of Cole had me a giggling school girl. I tell you, what I feel for him is true love!!! The story starts of with a rather big scene - amazing way to start the book. You're then left wondering how long as passed since the end of the last book. It doesn't feel like long, but that is soon answered. When Maggie says that she quite likes to induce tears in her readers she is not joking. From very early on in the book, I was left feeling so sad. I must say parts were in 'The Time Travelers Wife' style for me - yep that sad!!! As with the other books Maggie kept writing from different peoples perspectives. I love that. You really can see the change in speech and thought. Its really fun for your mind to adjust from one person to the next in quite short spaces of time. I was left questioning some of the processes in the book at times and felt a little confused, but this was generally cleared up quickly and so I wasn't left scratching my head too much. Towards the end the book takes quite a dramatic turn, which was expected seeing as its the last book in the series. I really enjoyed the 'BIG' scene. Sadly I have to say the conclusion to the book wasn't quite what I was hoping for. For me there was rather a large question still left unanswered. I have read and enjoyed other books that have done similar things, but with this book I really wanted a thorough ending and so felt some what cheated of that. None the less this is a great finale and I'm still and always will be a huge Maggie fangirl. I'm itching to read The Scorpio Races!!! 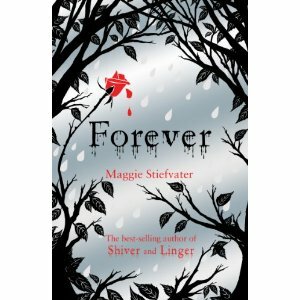 Since writing this review it seems there has been lots of speculation as to whether Forever ended on a cliffhanger or not. Maggie has stated that it doesn't, but still for me there was a little too much speculation. I really do think everyone should read this & then tell me their thoughts on it!!! I haven't read any of this series yet so I haven't read too deeply into your review, but it sounds an awesome series and I'm looking forward to starting it soon. This book is brilliant as it can hit all of your emotions and can make you cry. It is also beautifully descriptive! Ten out of ten.